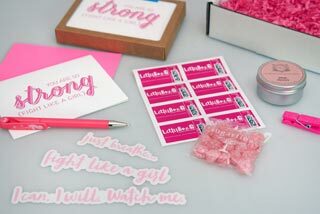 Your gift box will include one boxed set of eight of our pink BCA Strong – Fight Like a Girl letterpress cards, as well as eight custom-designed pink U.S. postage stamps; three vinyl die-cut motivational stickers (I can. I will. Watch Me., Fight Like a Girl, & Just Breathe) durable enough to adhere to your water bottle, laptop, or car; a pink unicorn design 7-Year Pen; a luxury travel tin candle by Aquiesse in Pink Peony scent; a pouch of Bella Rosa rosewater candy rosettes imported from Italy from fine confectioner Sugarfina. 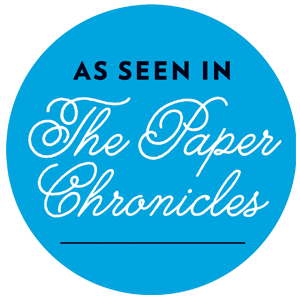 5% from the sale of all our BCA Strong – Fight Like a Girl letterpress cards will be donated to the National Breast Cancer Foundation, Inc., whose mission is to provide help and inspire hope to those affected by breast cancer through early detection, education and support services.